This is a parasitic, mold-like sac fungus. In North America it grows on Peppery Milkcap (Lactarius piperatus), Short-stemmed Russula (Russula brevipes), and possibly other white Lactarius and Russula species. 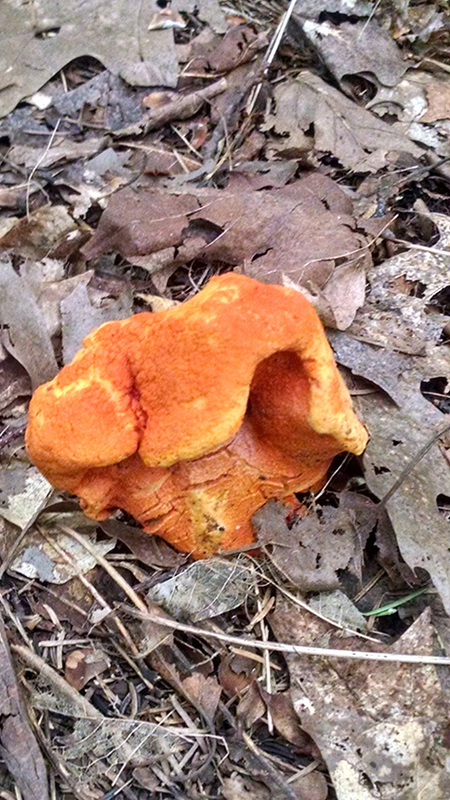 It appears as a bright orange coating on a deformed gill mushroom. When view under a hand lens, the surface appears pimply due to minute, flask-shaped, fruiting bodies. Eventually, it completely covers the stalk (stipe), gills, and cap. The underground, vegetative part (mycelium) of this fungus grows on the mycelium of the host fungus and fruits at the same time. The bright orange to orangish-red tissue covers the fruiting body of the host before it emerges from the duff. The host mushroom is deformed and often is pitted with debris slightly embedded in the cap. The gills are reduced to blunt, chanterelle-like ridges. Edible when growing on an edible host. However, the deformed host may be impossible to positively identify. A supporting stalk-like structure lacking vascular tissue: in fungi, the stalk supporting the mushroom cap; in ferns, the stalk connecting the blade to the rhizome; in flowering plants, the stalk connecting the flower’s ovary to the receptacle; in orchids; the band connecting the pollina with the viscidium. I CATCH MY LOBSTERS WITH MY OWN HANDS, DON'T EVEN USE A TRAP. The first lobster mushroom of 2013 Ive found, hopefully a start to a nice season. This is a brief rundown of lobster mushrooms, sometimes they can vary a bit.